With the Airshow season well underway we still await the first flight of the Lancaster, It’s fuel tanks are back in and they have fuel in them,She sits on Jacks at the moment for undercarriage tests. Mid July will see the start of testing as long as everything is ok. 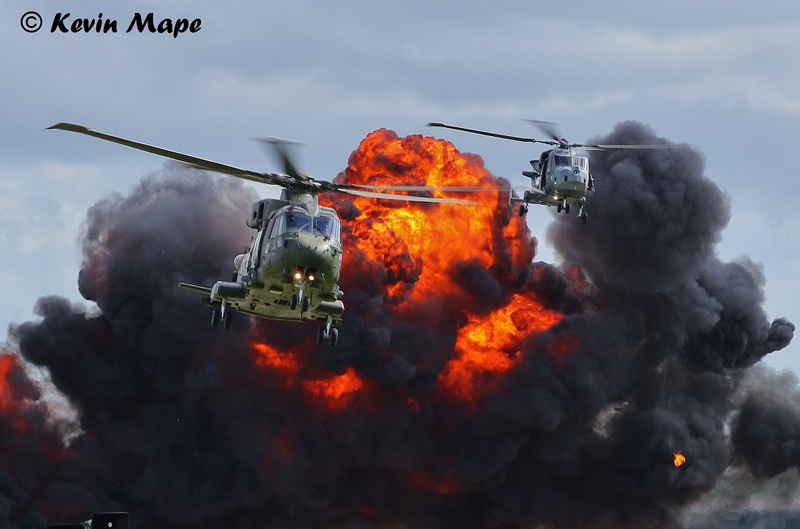 I was lucky enough to attend the Yeovilton Air Day on the 1st/2nd. It was good to have John Gabor join us at the fence today. ZG998/651Sqn/Defender AL1 c/s “Army Air 528” – Parked on Sierra. ZK352/BV/Unmarked-29(R)Sqn/Typhoon FGR4 c/s “Typhoon 35” – Return from Swansea. ZK365/Unmarked-41(R)TES/Typhoon FGR4 – c/s “Rebel 59” – First RAF mission of a Tranche 3 Typhoon. G-MCGE/BH/H.M Coast Guard/ S-92 c/s “Coast guard 912” – Overfly. ZK343/X/Unmarked-(II(AC)Sqn)/Typhoon FGR4 c/s “Tutan 33” – To TMF. – First visit coded X. 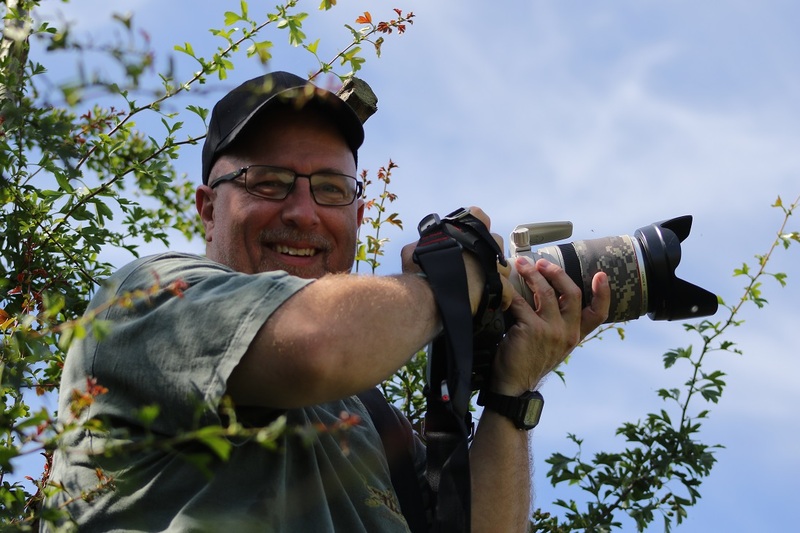 5th Tue – Log thanks to Steve & Val. WB569(G-BYSJ)/RAFC/Chipmunk 22 c/s “Chippy Sierra Juliet” – To BBMF. 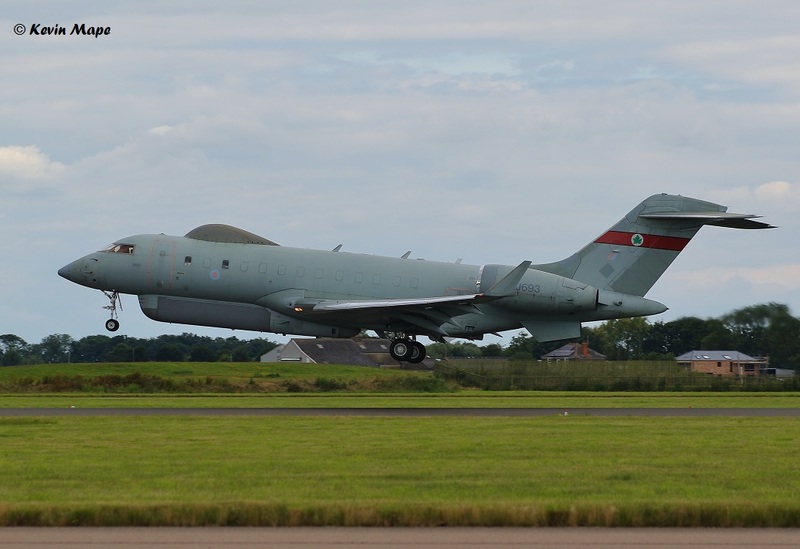 ZJ693/5(AC)Sqn/Sentinel R1 c/s “Firebird” – Roller. ZK336/FD/1(F)Sqn-(3(F)Sqn)/Typhoon FGR4 c/s “Typhoon 12” – From Lakenheath. 6th Wed Log thanks to Garf. ZG998/651Sqn/Defender AL1 c/s “Army Air 525” – Mission. ZK335/EB-G/41(R)TES/Typhoon FGR4 c/s “Apollo 2” – f/n recode ex EB-B. N350ER/Textron/King Air 350 c/s “N350ER” – Overshoot. XX323/RAFAT/Hawk T1 c/s “Cranwell 14” – Overshoot. ZK315/41Sqn 100 special/Typhoon FGR4 c/s “Rebel 57” – Full live QRA fit. 7th Thur Log thanks to Susie Matson. 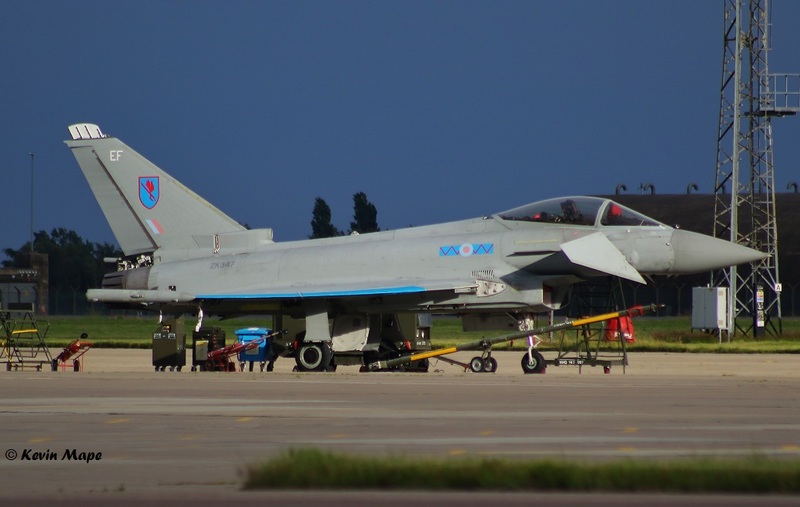 ZJ813/BL/29(R)Sqn/Typhoon T3 -Parked outside BBMF. ZK353/BQ/29(R)Sqn/Typhoon FGR4 c/s “Gunfighter 71”- Deployed Chute on landing. AB910/SH-F/BBMF/Spitfire Vb, c/s “Spitfire 90” -flypast over Lincoln Castle. Noted on wash pan : ZJ800/BC, ZK337/FP and ZJ949/Unmarked. asp: 8Sqn- ZH101, ZH102 and ZH104. 29(R)Sqn – ZJ814 BH, ZJ810 BI, ZK320 BR, ZK331 BT, ZK353 BQ and ZJ803 BA. 12th Tue Log thanks to Steve & Val. G-MAJE/JE/Eastern/Jetstream 41 c/s “East flt “101” in, “102” out. 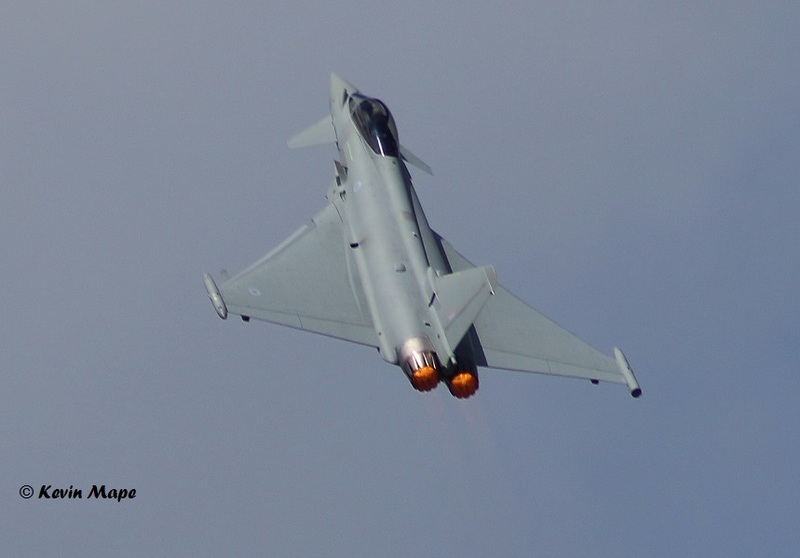 ZK335/EB-G/41(R)TES/Typhoon FGR4 – Noted on the Wash pan. 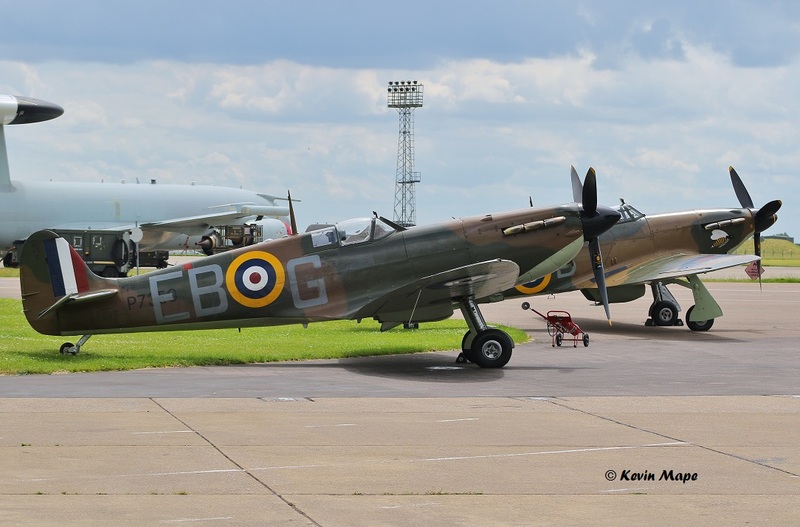 P7350/EB-G/BBMF/Spitfire IIa – Engine runs. ZK335/EB-G/41(R)TES/Typhoon FGR4 – Parked outside BBMF Hangar. LF363/JX-B/BBMF/Hurricane IIC – Parked outside BBMF Hangar. 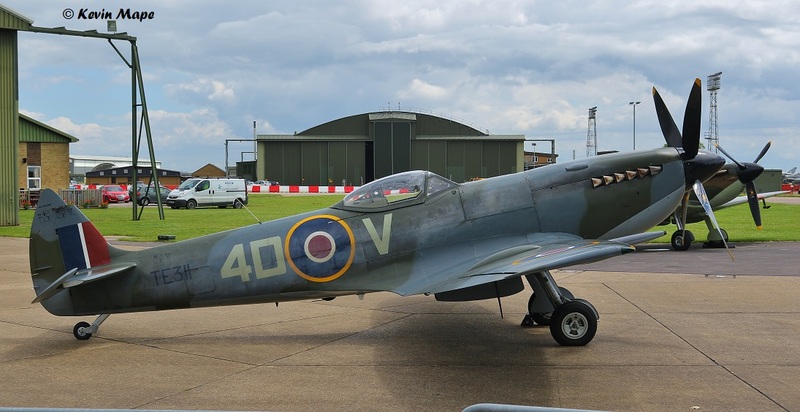 P7350/EB-G/BBMF/Spitfire IIa c/s “Spitfire 90” – Test flight. 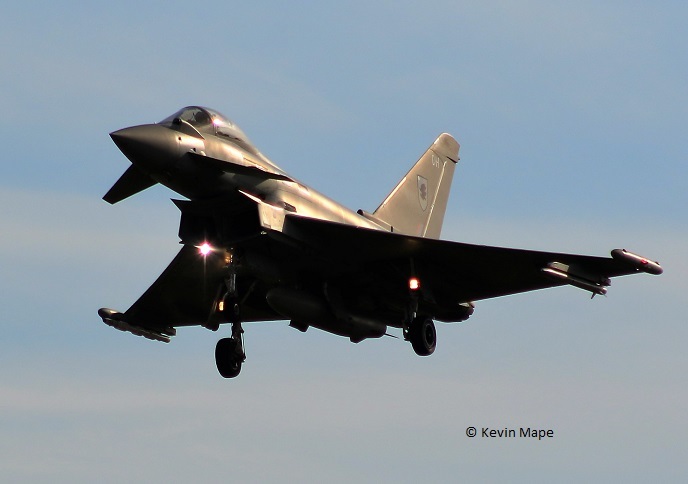 ZK379/BB/Unmarked/Typhoon T3 – Towed from North to South TMF. G-FRAH/Cobham/Falcon 20 EM c/s “Vader 63” Mission – Parked on Sierra. G-FRAU/Cobham/Falcon 20 EM c/s “Vader 64” Mission – Parked on the ASP. 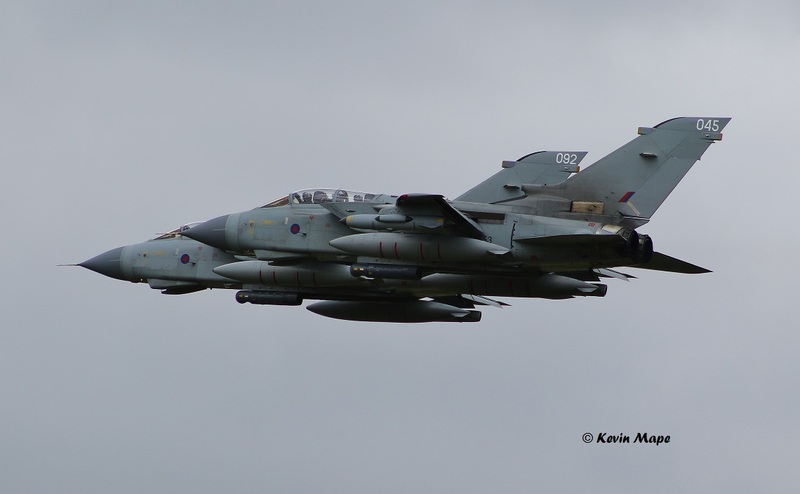 ZA463/028/Unmarked/Tornado GR4 c/s “Marham 57” – Overshoot. Night flying – Log thanks to Garf. from 17-40pm Onwards. ZJ806/BE/29(R)Sqn/Typhoon T3 c/s “Typhoon 38” – Left chute pack on the runway on departure. G-MAJE/JE/Eastern/Jetstream 41 c/s “East Flt 104” in “105” out. 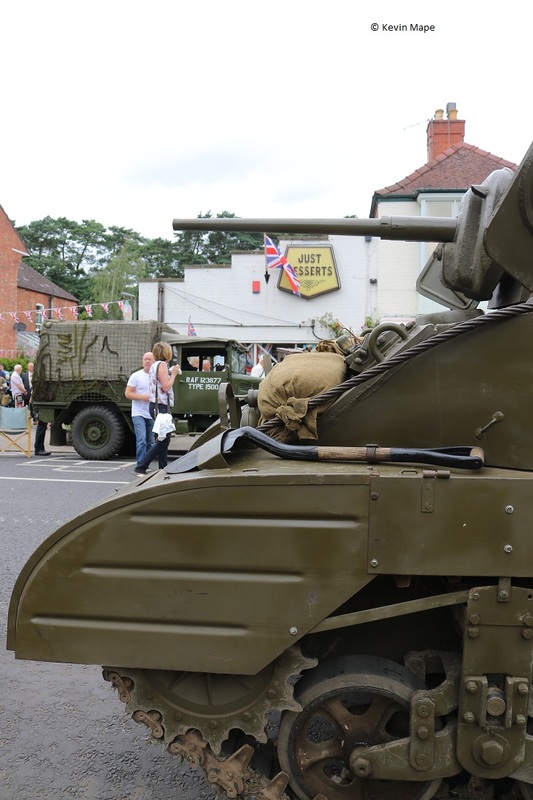 16th Sat (Woodhall Spa 40’s Weekend). 17th Sun (Woodhall Spa 40’s Weekend). 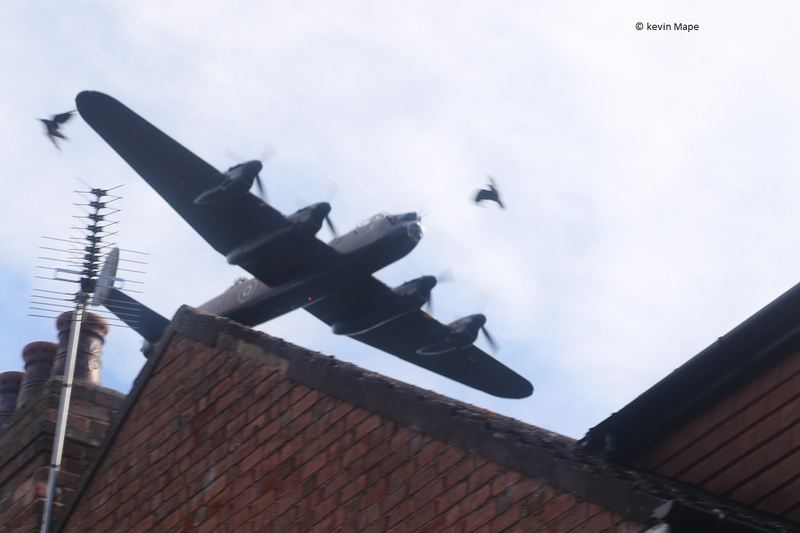 The Magical arrival of BBMF Lancaster I PA474 over Just Desserts. Parked on Sierra – G-SBOL/Steen Skybolt. XX453/ETPS/Gazelle AH1 c/s “*********” – Parked near the ASP. G-FRAR/AR/Cobham/Falcon 20 EW c/s “Vader 61” – Parked by the ASP. CV-22B – Overfly – North to south. 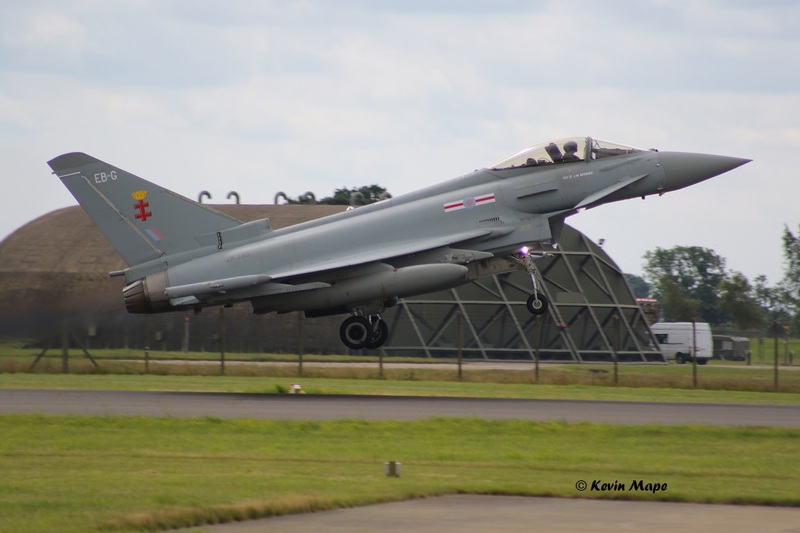 ZK332/EB-J/Unmarked/Typhoon FGR4 – Noted outside TMF. 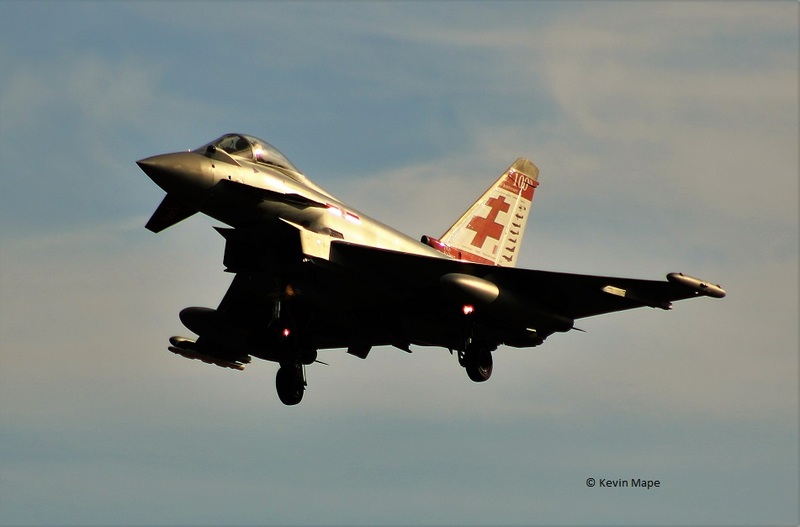 ZK316/FA/Unmarked/Typhoon FGR4 – Noted outside TMF. G-BGRE/Martin Baker/King Air B200 – Parked on Sierra. G-FRAR/AR/Cobham/Falcon 20EW c/s “Vader 61” – Mission. 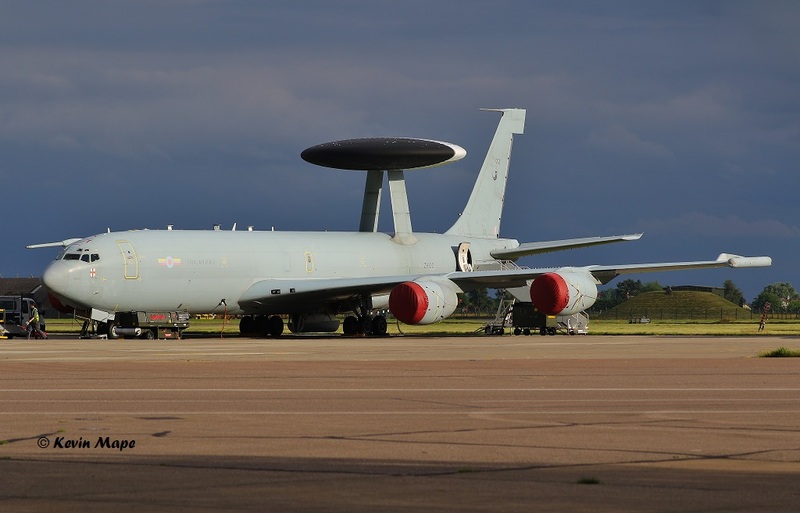 ZH104/04/8Sqn/Sentry AEW1 c/s “Nato 31” – Rollers then landed. 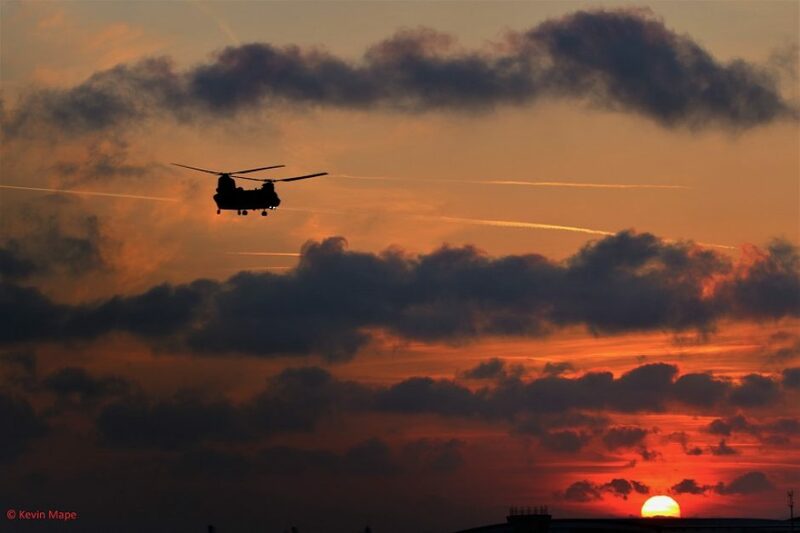 12-0063 + 1 /CV-22B c/s “Knife 72” – Overfly to Leeming. “Nato 35” – Ground abort. CE-02/30Sqn/ERJ-135LR c/s “Belgium Air Force 6161”- Parked on the ASP. CE-02/30Sqn/ERJ-135LR c/s “Belgium Air Force 61612 – Departed. 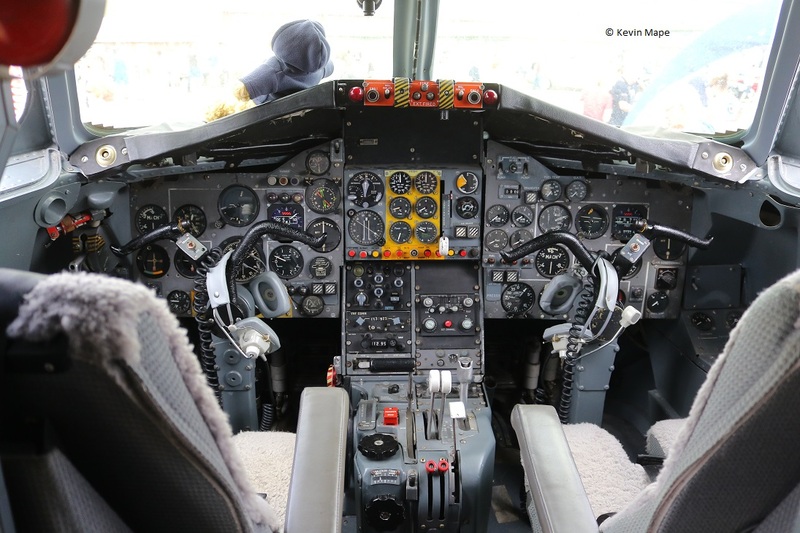 G-FRAO/AO/Cobham/Falcon 20EW c/s “Tasmin 71” – Mission. XX311/RAFAT/Hawk T1 c/s “Red *” – Overshoot. XX325/RAFAT/Hawk T1 c/s “Red *” – Overshoot. ZJ814/BH/29(R)Sqn c/s “Cobra 61” – ground abort due to bad weather over the vale of York. 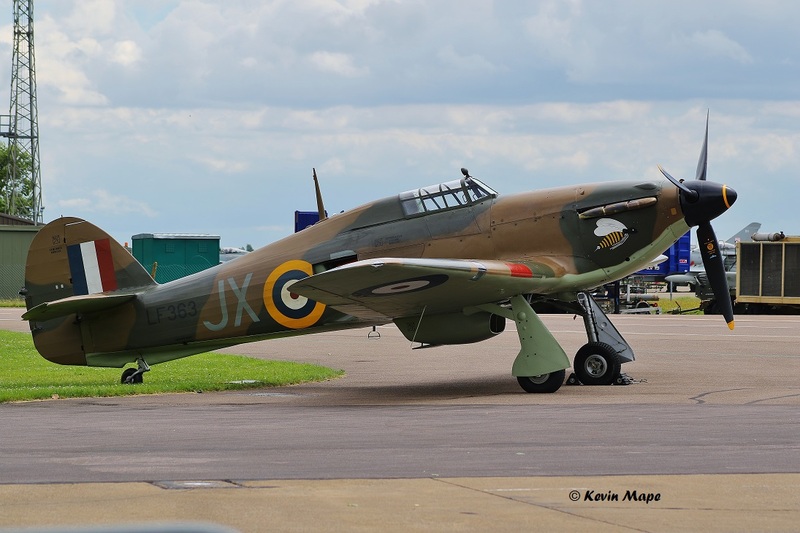 PZ865/EG-S/BBMF/Hurricane IIc c/s “Hurricane 02” – Display. ZJ810/BI/29(R)Sqn/Typhoon T3 c/s “Warlord 33” – Ground abort. 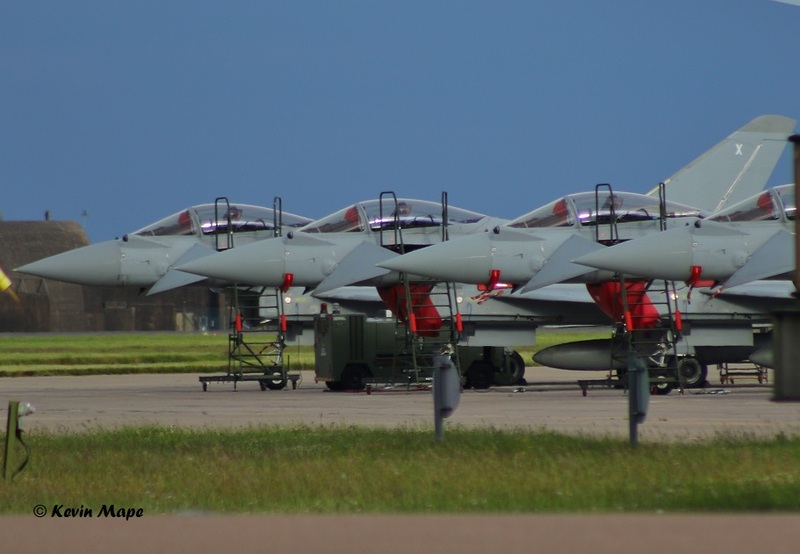 ZK334/A/II(AC)Sqn/Typhoon FGR4 c/s ‘Lossie 67’ – Parked on the ASP – To TMF. XX522 (G-DAWG)/06/SA Bulldog T1 c/s ‘GDAWG’ – To the ASP. G-AHKX/BAE /Avro C19 Anson c/s “GAHKX” – Parked on Sierra. G-MERF/Grob G115A/ c/s “GMERF” – To the ASP. 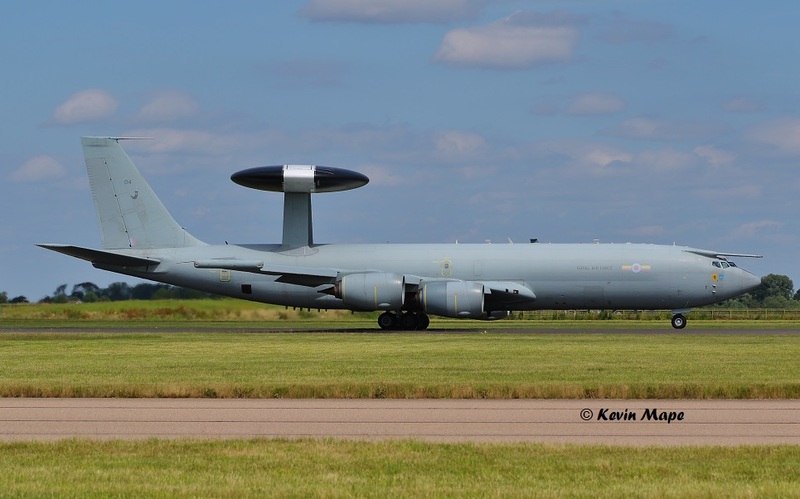 ZH107/07/8Sqn/Sentry AEW1 c/s ‘NATO 30’ – To the ASP. Noted on and around the ASP. XE597 Hawker Hunter FGA9 nose section – 1(F)Sqn marks. G-CKEV/R2/Duo discus Glider – RAF Halton Gliding club. 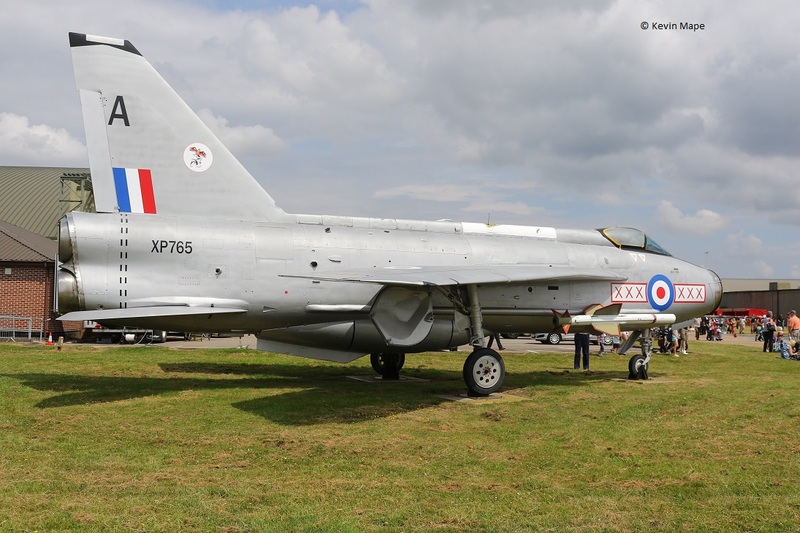 XS897/Lightning F6 – wears “XP765/A/29Sqn marks. – Preserved. 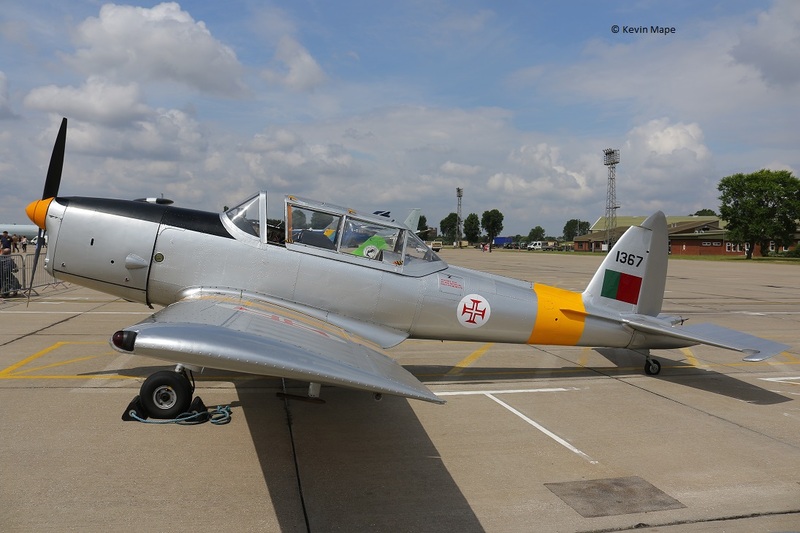 G-UANO/OGMA DHC-1 Chipmunk 23 – wears FAP marks 1367. J-881/322Sqn/F-16AM – Royal Netherlands Air Force. FA-123/Display special marks/F-16AM – Belgium Air Force. CE-02/30Sqn/ERJ-135 – Support for the Belgium F-16’s. PA474 /KC-A/Lancaster I/P7350/EB-G/Spitfire IIa/PZ865/EG-S/Hurricane IIc/ZK320/BR/Typhoon FGR4. FA-123/Special display marks/F-16AM – Display. ZZ535,ZZ375/Wildcat HM2 / Blackcats – Display. 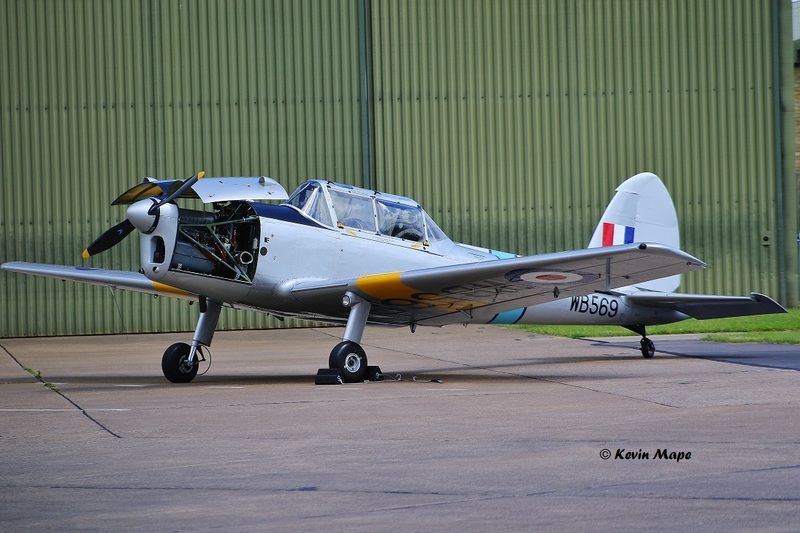 G-ALWB/Chipmunk, G-BLTC/Turbulent, G-ANZT/Jackaroo, G-AZGY/Emeraude,LF858/Queen Bee – Display. G-IIRI/Xtreme Air Sbach 300 – Display. ZK017/H,ZK016/G/ Hawk T2 – departed. 00-3001/LN rd/ 48FW/f-15E c/s “Panther 81” – Overshoot. G-FRAH/AH/Cobham/ Falcon 20 EW c/s “Mothball 91” – Parked on the ASP. 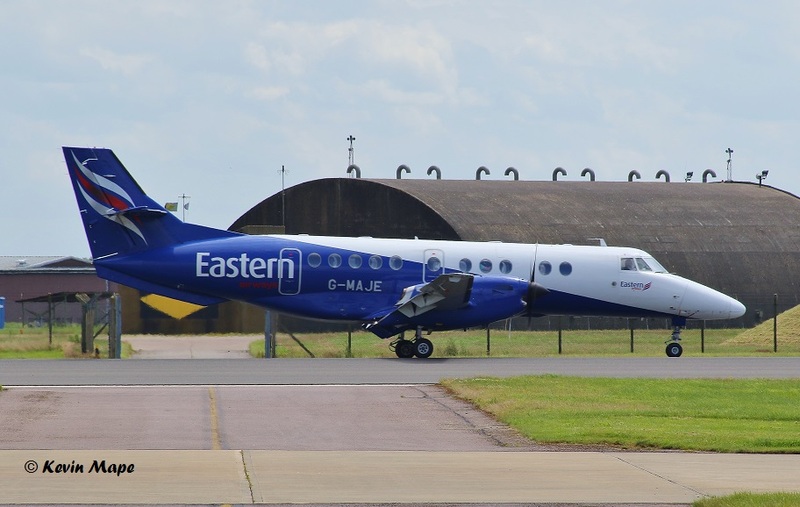 G-MAJE/JE/eastern/Jetstream 41 c/s “East flt 104” in “105” – out. **-****/ CV-22B c/s “Knife 71” – Overfly. G-MAJE/JE/Eastern/Jetstream 41 c/s “East Flt 102” – parked on Sierra. G-FRAU/AU/Cobham/Falcon 20EW c/s “Vader 64 – parked on the ASP. ZG998/651Sqn/Defender AL1 c/s “Army Air 533” – Parked on Sierra. 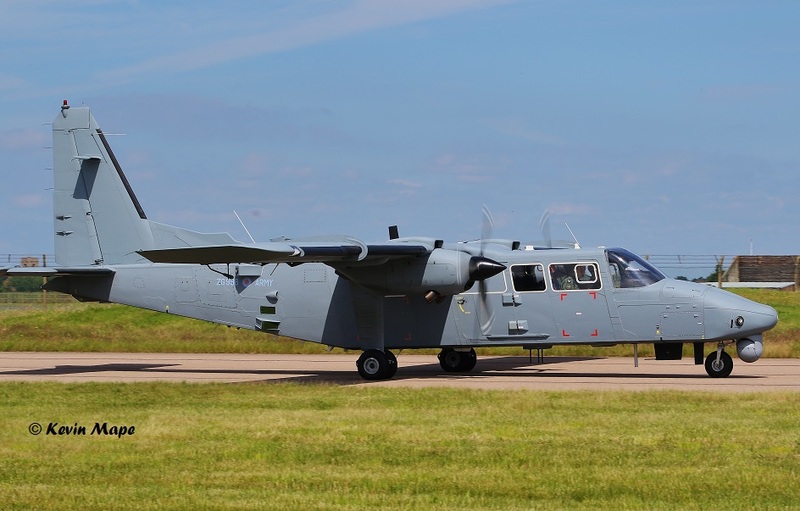 ZH104/04/8Sqn/Sentry AEW1 c/s “NATO 35” – Departed. G-FRAO/AO/Cobham/Falcon 20EW c/s “********” – Departed. 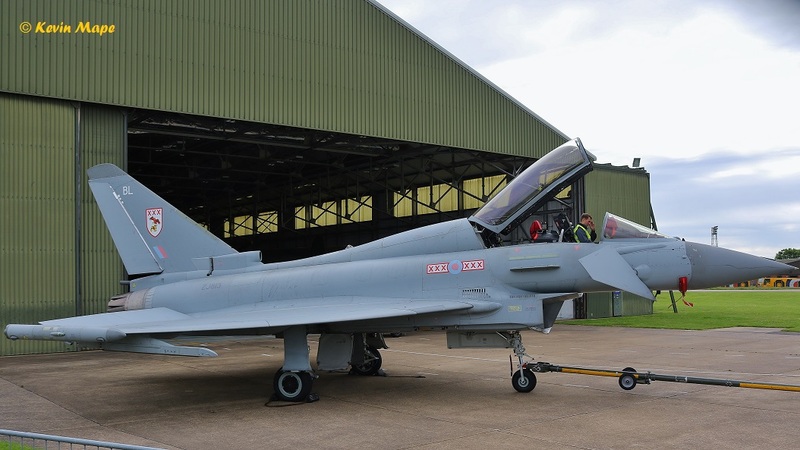 ZJ931/DA/XI(F)Sqn/Typhoon FGR4 – Towed from Foxtrot to HAS1 for QRA duty. ZJ931/DA/ towed from HAS1 to HAS3 on QRA duty. ZJ937/DT/ towed from HAS4 to HAS 1 off QRA duty. G-FRAU/AU/Cobham / Falcon 20EW c/s “Mothball 91” N/S parked on the ASP. G-FRAO/AO/Cobham/Falcon 20EW c/s “Mothball 92” – Parked on the ASP. 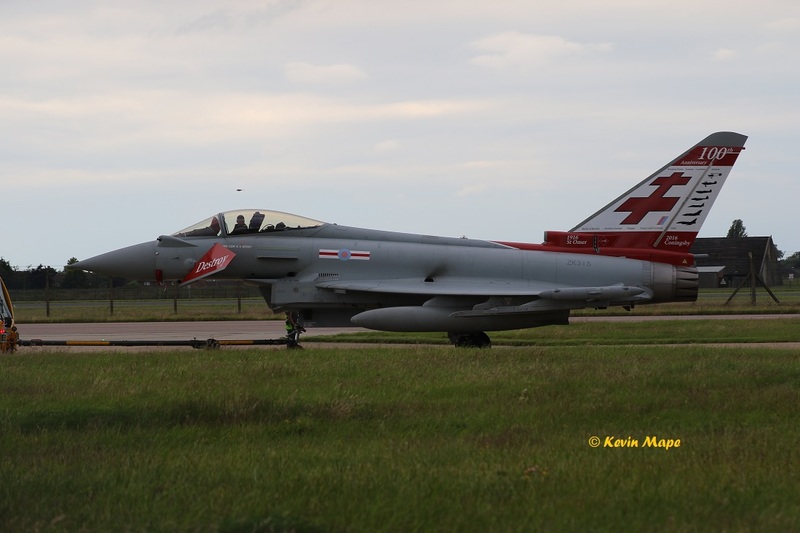 ZJ947/EB-L/41(R)TES/Typhoon FGR4 – Towed to the north side from foxtrot. G-FRAU/AU/Cobham/Falcon 20EW c/s “Mothball 91”- Mission. G-FRAU/AU/Cobham/Falcon 20 EW c/s “Mothball 91” – Parked on the ASP. ZG998/651Sqn/Defender AL1 c/s “Army Air 533” – Mission. 28th Thur – Log thanks to Susie Matson. 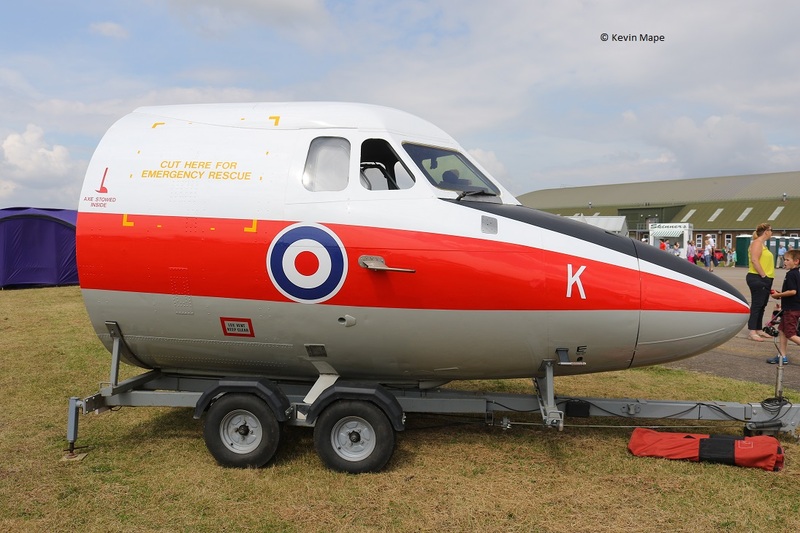 ZK332/EB-J/Unmarked – Towed from the paint shop to TMF. ZK307/Unmarked c/s “Guva 31” ? ZK322/GS/Unmarked c/s “Guva 32” ? G-FRAU/AU/Cobham/Falcon 20EW c/s “Mothball 91” – parked on the ASP. ZJ197/3Reg/Apache AH1 c/s “Army Air 321” – Overfly. G-FRAU/AU/Cobham/Falcon 20 EW c/s “Mothball 91” – Departed. ZG998/651Sqn/Defender AL1 c/s “Army Air 533” – Ground abort. ZJ940*/–,ZJ945/-,ZJ948/–,ZJ922/QO-C.ZK326/FB. * marked as DJ666.